“The Ethnologische Museum and the Asiatic Museum are currently located in Dahlem, a suburb 45 minutes by subway from central Berlin. This placement is a relic of the cold war and a divided Berlin, and has placed these magnificent museums far off the beaten track for most Berlin visitors. Plans are underway to move both museums to a new site on the grounds of the former Berlin royal palace, right next to the “Museum Island” that houses five other major Berlin museums. This huge new museum will be called the Humboldt-Forum. “The museums in Dahlemwill close some time in 2016, and the new museum will not open until at least 2019. For all those interested in Mesoamerican art and archaeologywho have never visited the DahlemMuseums, we strongly recommend that you take the opportunity to do so before they close. This extraordinary collection features the objects brought back to Germany by Alexander vonHumbolt and Eduard Seler, among many others. Amy and I spent four days photographing inthe vast Mesoamerica room, and at the end of four days we were still discovering new treasures. “The new museum will have more space for overall collections, including South American collections that have never been displayed, but will have much less space for Mesoamerica. So — much of what is now on view will, alas, go into storage. See it before it disappears! 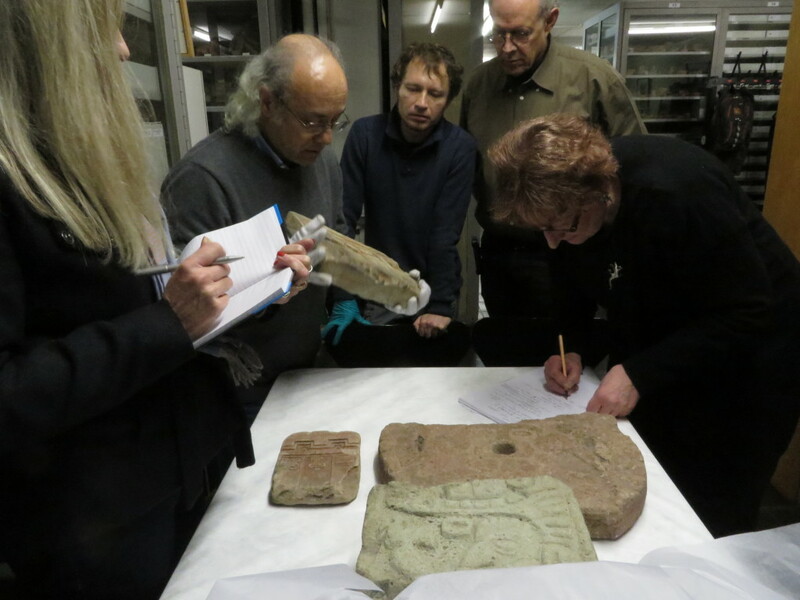 “The two-day seminar, entitled “Breaking Mesoamerican Codes”, examined the role of the Mesoamerican collections in the new museum. While the current Mesoamerican installation is comprehensive, the new installation will be focused on writing and communications systems in Mesoamerica. “A day of papers on museum plans and Mesoamerican writing systems was followed by a “Long Film Night” (apparently a Berlin institution), in this case featuring a screening of “Dance of the Maize God” followed by a panel discussion featuring myself, documentary director Carola Weider, Mayanist Mark Zender, and Margarete von Ess, Director of the Baghdad Field Office of the German Institute of Archaeology and director of excavations at Uruk-Warka. After the seminar and a brief reception the evening continued with a screening of the two-hour “Dance of the Maize God”. About 30 hardy souls actually made it to the end of the five-hour marathon! This entry was posted in blog, frontpage and tagged Berlin, Ethnologisches Museum, Night Fire Films on March 26, 2015 by Rosey Guthrie.